Our properties are located throughout the heart of Kansas City. Whether building single family homes or multi-unit residential complexes, UC-B Properties is committed to sustained, modern urban development. 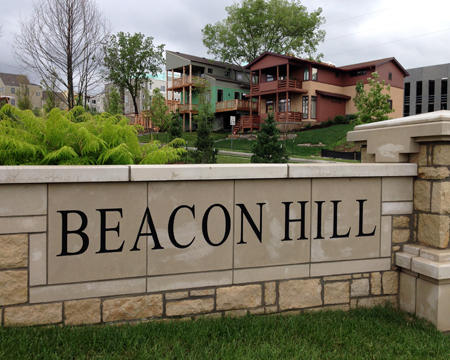 Beacon Hill is designed as a mixed-use, new-urbanist neighborhood located in Kansas City, Missouri within walking distance of Hospital Hill, Crown Center, and Hallmark Cards. Covering almost 90 acres with a rolling terrain and panoramic views of downtown, the neighborhood has direct access to Bruce R. Watkins Drive, I-70 and I-35. The project is a 353 Redevelopment Area with 25-year tax abatement (100% for 10 years; 50% for 15 years). Nearby restaurants include Teocali, You Say Tomato, Succotash, Filling Station, Magnolia Cafe, Martini Corner. There is a Bank, Costco and a Home Depot within a few minutes drive. A 25,000 square foot Grocery Store is coming soon, as is a Hotel. UC-B Properties has built contemporary apartments and luxury townhomes in Brookside! The Brookside Neighborhood is a metropolitan hub of beautiful homes, unique shops, trendy restaurants, and cultural attractions. Home to some of Kansas City’s hippest residents and urban professionals, Brookside was the this city’s first suburban shopping area. Brookside now has over 70 proprietors and offices which have elegantly preserved the original architecture and kept the neighborhood appeal. In 2016, UC-B Properties brought contemporary one and two room apartments in the new 63 Brookside. UC-B Homebuilders is also bringing luxury townhomes to the area in the form of 63 Oak. Contemporary style in Hyde Park at Gilham Park Row! Hyde Park is a vibrant urban oasis for both homeowners and renters. This neighborhood includes turn-of-the-century mansions, bungalows, shirtwaists, and more than 1,600 market-rate apartments on Armour Boulevard. UC-B Properties has built contemporary multi-unit projects, such as the award-winning Gillham Park Row, and well as remodeled historic single family homes in the area. One of UC-B’s very popular Longfellow single family homes. The Longfellow neighborhood began as a first tier suburb in the late 19th Century and still includes many historic structures reminiscent of early Kansas City architecture. UC-B Properties has built both single family homes as well as Twenty9 Gillham, a modern residential complex of one and two bedrooms. All of these projects have been very popular, with residents buying and leasing before construction was complete! Twenty9 Gillham offers state of the art urban living in the heart of the city, while the Longfellow single family homes are nestled in blocks of historic and beautifully-maintained homes. UC-B Homebuilders is bringing homes with modern appeal to this historic neighborhood! Manheim Park is a new hub for community revitalization in Kansas City. Multiple non-profit organizations, developers, architects and citizens have come together in recent years to restore this hidden gem with historic appeal. UC-B Homebuilders is proud to be a part of this revitalization as part of our mission to focus on creating communities in historic neighborhoods through high design and new construction. Officially known as the Eastern 49/63 Neighborhood, the presence of Rockhurst University makes for a diverse, neighborhood that is home to educational, cultural and scientific institutions. From renovations to new single family homes to fully furnished studios, UC-B Properties is bringing quality design to this historic neighborhood.